“I see myself in my customers,” Michelle expressed, as we wrapped up our third training for the community leaders who work with us as Promotoras and Facilitators for SFC’s Food Access projects. Our Farm Stands project, as it has grown and evolved through our collaboration with the City of Austin’s Fresh for Less Initiative, a network of 14 markets selling local produce in food insecure areas of Austin, is a community-centered project by design. In addition to operating sales at Fresh for Less Markets (previously known as Farm Stands) in their neighborhoods, Facilitators work to engage customers in the “why” and “how” about cooking with local produce, in addition to providing customers with a positive shopping experience. Promotoras work to inform new customers about Fresh for Less sites and conduct recipe sampling events. When it comes to food, each of us is on a journey of learning. 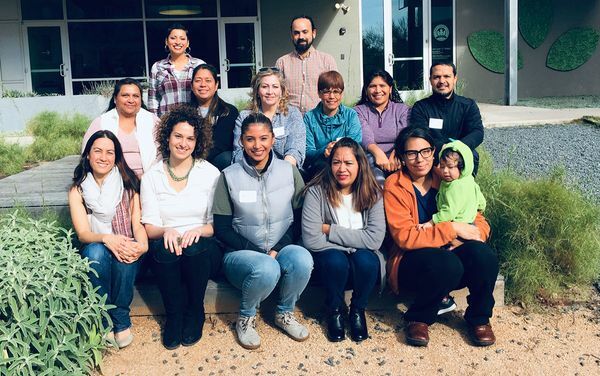 Teaming up with our The Happy Kitchen/La Cocina Alegre® program, we brought Food Access leaders from across our various sites together to provide additional training and strategies to promote products at the markets. The Happy Kitchen team shared suggestions about ways engage with customers and to talk with them about preparing produce that they may be less familiar with, as well as suggestions they could pass along to shoppers about how to encourage the whole family to “Eat the Rainbow.” Of course, the team also shared recipes and samples with the Facilitators and Promotoras, which were a delicious treat and a tremendous resource to add to their toolkit. 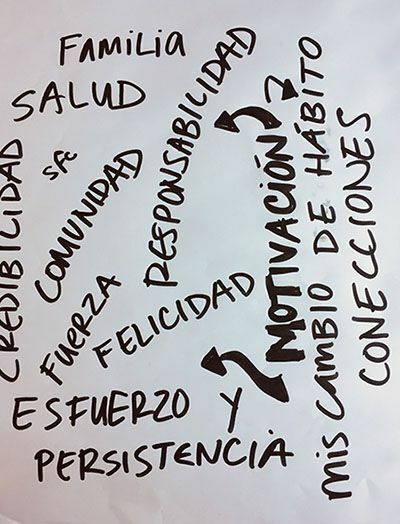 During our reflection time at the end of the training, we asked everyone to share - in one word - what motivates them continue doing this work. You can see these words in the image below, along with a picture of the group. Just to name a few words of inspiration: Perseverance, Community, Connections, Strength, and Family. We heard loud and clear that community leaders are engaging in this work not only as part of their personal journey, but to support a food system that is inclusive and supportive of all communities. Fresh for Less Markets are located in food insecure areas of Austin, at familiar spaces where people are already spending their time, such as schools, libraries, community centers, etc. We are proud to continue this work in collaboration alongside Farmshare Austin, a Fresh for Less partner organization. Feedback from customers shows that they are interested in buying local and organic food, farm stands are in convenient location, and shoppers are consuming more fruits and vegetables. We are honored to support the continued engagement of Food Access Promotoras and our communities in sharing and preparing healthy, local food.